The story of explorer Percy Fawcett's obsessive quest to find a lost city in the Bolivian jungle. Your attitude to filmmaker James Gray probably depends on your geographical location. The French adore him, Americans are ambivalent, and in the UK and Ireland we barely know he exists, as his movies barely get released here (we've given up on a release of The Immigrant at this point). I've been largely unimpressed by his CV so far (though I've yet to see The Immigrant and may have to fork out for an import disc now), but his latest, The Lost City of Z had the same effect on me as Paul Thomas Anderson's There Will Be Blood, a lauded filmmaker's work finally clicking with my sensibilities. 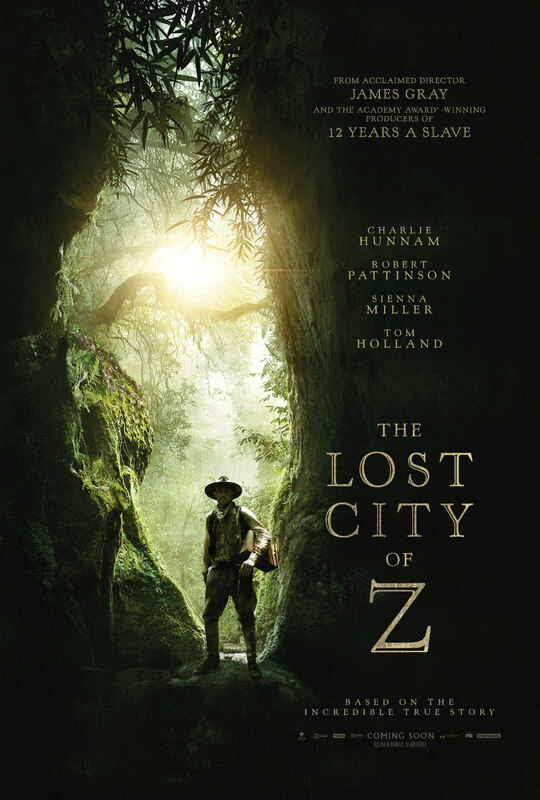 Adapted from David Grann’s non-fiction book, The Lost City of Z tells the story of British explorer Percy Fawcett (Charlie Hunnam) and his attempts to find the titular destination in the early twentieth century. Opening in 1905, Fawcett is called into the offices of the Royal Geographic Society and offered the chance to travel to the Amazon jungle in order to map the region, as both the Bolivians and Brazilians mistrust each other and have thus agreed to let the Brits take on the task. Desperate to redeem his family name (his father was an alcoholic and gambler), Fawcett agrees and sets off for South America accompanied by fellow explorer Henry Costin (Robert Pattinson). While in Bolivia, Fawcett learns of a hidden city where no white man has ever ventured. He dismisses it as mere legend initially, but when he discovers remnants of pottery deep in the jungle, he becomes convinced that a lost city, which he dubs 'Z', does indeed exist. Over the following two decades, Fawcett devotes his life to discovering Z, making a series of doomed trips to the Amazon while contending with the setback of World War One, and the small matter of his wife (Sienna Miller) and kids. From the opening of his film - ambient rain-forest sounds quietly murmuring under a black screen - Gray draws us into both the drama and the mind of its protagonist. As someone who breaks out in a rash if I leave my city, even I was won over by the temptations of the Amazon as portrayed through the obsession of Fawcett. Some may see his quest, which leaves his children essentially to grow up without ever really knowing their father, as narcissistic, but it's a commitment he makes for the betterment of the world, of science, of the adventurous spirit that fuels human progress. At one point, the poet Robert Browning is quoted - 'A man's reach should exceed his grasp, or what's a heaven for?' - and it could be taken as the motto of not just Fawcett but Gray himself. Of the many superlatives that could easily be applied to his film, 'ambitious' is the most apt. Determined to achieve a sense of realism, Gray shot his movie in the jungles of Colombia, ignoring the advice he received from Francis Ford Coppola to avoid such madness. This adds an extra layer of sensuality to the film, making explicit the intimidating task faced by both the filmmaker and the hero of his tale. 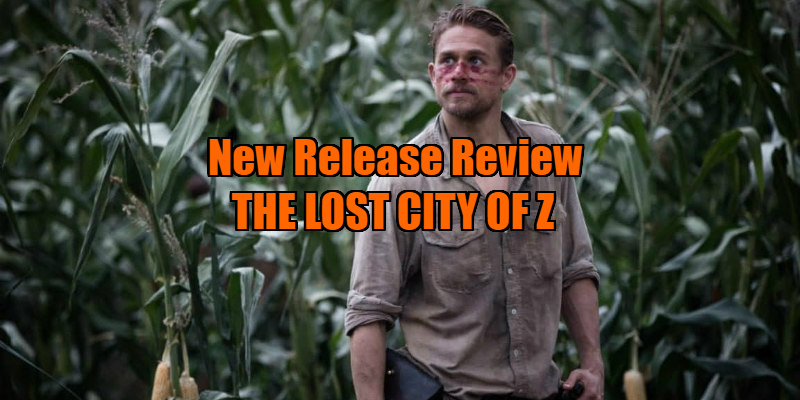 Shot in painterly fashion by Darius Khondji on 35mm with nary a pixel of CG visible, The Lost City of Z has a timeless feel, with Gray steadfastly avoiding any intrusive camerawork to deliver a film that oozes craft and class from every sprocket of its negative. David Lean would seem a clear visual influence, but thematically it owes much to the work of Philip Kaufman. Z is something of a British prequel to Kaufman's space-race drama The Right Stuff, explorers like Fawcett the astronauts of their day, and it boasts the same sense of wonder and nostalgia for a time when there was still something left to discover on the sphere we call home. There's an explicit nod to the Kaufman penned Raiders of the Lost Ark when Fawcett and his son (Tom Holland) are seen emerging over a hill, pursued by angry tribesmen, while the theme of attempting to escape your class while being drawn to a way of life viewed as savagery echoes that of Kaufman's film of Richard Price's New York gang novel The Wanderers. As with her director, I've previously found myself unconvinced by Sienna Miller, but she's excellent here, managing to elevate a role that could easily have been the early 20th century equivalent of the astronaut's wife left to gaze tearfully at the stars. In her increasingly confrontational meetings with Fawcett, her Nina hints at the rise of the Suffragette movement, herself advancing one form of progress while her husband seeks another. At 140 minutes, The Lost City of Z justifies its running time (which is only 10 minutes longer than the Beauty and the Beast remake). It's a banquet of a movie, a visual feast that also provides plenty of food for thought. If Gray's reach has exceeded his grasp here, it's a compliment to both his ambition and his talent. The Lost City of Z is in UK/ROI cinemas March 24th.